Commence this journey to intriguing Eastern Europe in Zagreb. Zagreb is a modern city with a historical center, the old Kaptol district, where stately Austro-Hungarian buildings house elegant restaurants and fashionable boutiques. Visit the Government Palace and Parliament as well as two of the most beautiful churches in the city. Next, spend time in Sarajevo where some of the city’s sights include a picturesque Turkish bazaar and a museum named for the man who assassinated Archduke Ferdinand, which sparked WWI. During a walking tour of Old Dubrovnik admire the Rector’s Palace, the Bell Tower Clock and Orlando’s Column. Contemplate the serene quiet of two of the city’s monasteries and marvel at one of the world’s oldest pharmacies. Take an excursion outside the city to view the Bay of Kotor, one of the longest and deepest fjords in Southern Europe and visit the coastal city of Kotor, with its Venetian style of architecture. 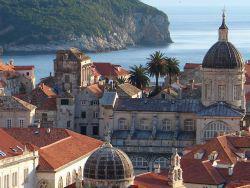 Return to Dubrovnik to say goodbye to the shimmering city before you return home.